We put public funding into events to stimulate economic activity and for the community. So, naturally, big events, and lots of funding means economic and community activity through the roof. Between 4th and 15th April this year the Gold Coast hosted the Commonwealth Games. The Gold Coast is one of the top five tourist regions in Australia. The Commonwealth Games benefits from a significant amount of public funding and volunteer effort and should, in theory, have created both a spike and an ongoing increase in local spending, especially in the beachside suburbs of Broadbeach and Surfers Paradise. But the Commonwealth Games, like the Olympics, or the Formula 1 are non-participatory. That is, we, the public, travel to a a suburb somewhere in one of our cities and watch others doing something, rather than participating ourselves. These type of events have a patchy record as far as being a good return on investment. The Olympic Games, for example, usually leaves the host with little more than a big financial headache. Although there are plenty of people and organisations who do very well out of it. When the April data for our bank transaction application, Spendmapp, was ready, I looked at how the heart of the Gold Coast fared this year compared with the same time last year. Did the Games generate a big spike in spending? To cut to the chase, the answer is ‘not really’. Some sectors did well, but there are some beachside traders who did not take home the gold. The impact of the Games has been estimated to be a Gross State Product increase of $2 billion (In Queensland obviously). This is mostly due to a government injection of $1.78 billion (largely to build the infrastructure). Part of this impact is down to tourism expenditure, specifically $323 million during the Games and then an additional $550 million over the next nine years. This is based on a mix of day and overnight visitors, domestic and international. 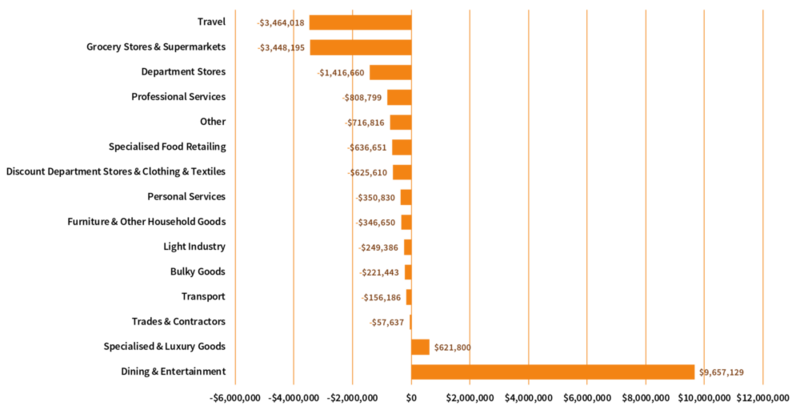 Figure 1 shows the breakdown for the impact during the Games (i.e. the $323 million). Our analysis is not about the larger impact. It’s about the effect on the traders in the suburbs at the heart of the Games and, therefore, it’s really about the domestic visitor spend in the local area and comparing what the model outputs forecast and what the bank transaction data shows actually happened. There are a lot of ways to cut up the actual figures. We have 15 expenditure categories to look at; different time periods (pre, post and during the Games), visitor and resident spend, plus the number of people spending and the average spend per person. To make it simple, in the first instance I’ve just compared April 2017 with April 2018, looking at total spend by residents and visitors, as well as the number of transactions and the number of unique cardholders spending money in the two suburbs. · Total spend was down by 5%. This is despite the data not factoring in inflation and the region experiencing population growth in the order of 2%. Spending should have been up by around 4% just on the basis of these two dimensions alone, let alone the Games. · The biggest losses making up this 5% came from lower spending in grocery stores and supermarkets, as well as Department stores. · There was a lot of public discussion about how the hotels were relatively empty. Apparently most people who did visit for the Games used AirBnB. Spendmapp doesn’t capture AirBnB spending (it just goes into online spend). But what it did show was a significant drop in spending on travel-related activity including local hotels. · While the model-based economic impact estimated $97/day for domestic visitors, we see that average spend per visitor to Surfers Paradise and Broadbeach was $46. They might be spending $97/day across Queensland, but certainly not locally. · The only sector that really benefited was Dining & Entertainment. 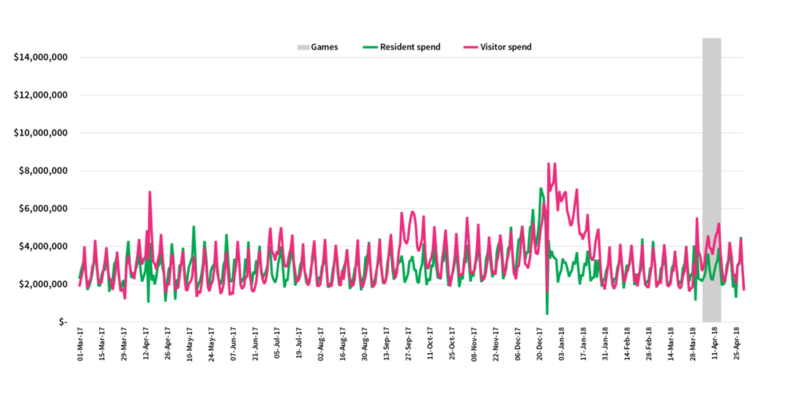 · Looking at total visitor and resident spend by day we can see the Games period (and even leading up to it) was less active than the typical Gold Coast Christmas holiday period and not much more than the level of activity in 2017. As far as generating an economic return for local traders and, therefore, for the municipal economy of the Gold Coast? Probably not. Which doesn’t surprise me. Despite what might be said when drumming up support, these major non-participation events are not run to generate local economic returns. They are not community building, they are often not good for local businesses. Have them, by all means, but let’s stop kidding ourselves they are good (economically at least) for the community they are staged in, or that they’ll bring in more money than they cost. And let’s not forget about who is picking up that cost. And while we’re at it, maybe we should aim to do a better job at economic impact modelling. Some reference class forecasting maybe, or more robust post-event analysis using bank transaction data. Then use this post-event analysis to inform the impact modelling for the next event. Hotels, taxis, souvenirs and tourist attractions amongst other things.